Last night was the 2013 final of the Great British Bake Off, a show the popularity of which it’s hard to overstate for all of you reading from outside the UK. A baker’s dozen of talented home chefs competed over 10 or so weeks to be crowned the star of all star bakers, and to see their own profiles as artisans rise exponentially as they appeared next to their gorgeous creations on TV. There aren’t many television programs I watch religiously – and most are US cable dramas – but the Bake Off is one of them. This might surprise those of you who know me as a feminist and an activist scholar-teacher. It’s just a bit of baking, yes? And: there’s nothing more retrograde than a woman (seeking praise) in the kitchen, right? A few weeks ago I probably held at least some of this very prejudice, but right now I want to dispute both of these claims. 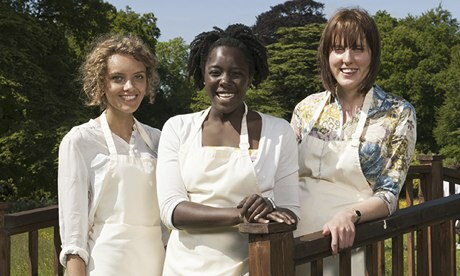 For one thing, although the Bake Off features healthy numbers of both men and women each season (6 and 7 respectively in 2013), this year the men dropped off early, leaving the final few weeks to the women and leading up to a final starring three exceptionally skilled female bakers, each of whom showcased her own distinctive, impressive style. Each week I got a sense of these women as artists, as technicians, as performers with very clearly framed personalities (partly down to the structure and shaping of the show, sure, but also very clearly down to these womens’ own performance personas), as friends, as competitors, and as human beings. Effectively, the Bake Off became for me a reality drama about a group of women at work, aiming to exceed their own personal bests each week; the fact that it was work in a kitchen became, simultaneously, both crucial context and beside the point. But more on that in a minute. The criticism ranged from the gently cynical to the downright obnoxious, but as the series went on I noticed an increasing degree of personal vitriol and misogyny. We (female) finalists are supposedly too meek, too confident, too thin, too domestic, too smiley, too taciturn … My self-doubt has been simultaneously labelled pathetic, fake, attention-seeking and manipulative. … Kimberley’s self-assurance – a character trait so lauded in men– has been rebranded as smugness, cockiness and even malice. There have been the sadly predictable comments on the bakers’ weights (as though it’s unfathomable that anybody could enjoy food and yet be slim), and charming debates on which of the finalists is the most “shaggable”. And then there’s the broader background of misogyny and gender politics against which this has all played out. It’s a culture of frilly baking versus macho Michelin stars, of real chefs versus domestic goddesses. Food has become divided and gendered, torn between the serious sport of haute cuisine and the supposedly antithetical world of women pottering around in home kitchens. To dismiss the Bake Off is, I’d argue, to buy into more than a little of this stereotypical, sexist framing, and to fail to recognize the hard work as well as the impressive achievements of the (mainly, in the end, women) participants. Further, to dismiss the show is to oversimplify the nature of that work and those achievements. While I’m hardly suggesting here that baking is where the revolution lies, smacking down the women for whom the kitchen is a workshop, a studio, a laboratory or a canvas is hardly a feminist gesture. And the three finalists this year – Frances Quinn, Ruby Tandoh, and Kimberley Wilson – demonstrated that, in fact, their shared kitchen was all of these spaces and more. Quinn, this year’s winner, is a designer, an artist as well as an artisan; she was the dark horse and something of a surprise winner, as she was also, repeatedly, the target of the judges’ claims that she favoured “style” over “substance”. What impressed me about Quinn was her refusal to change her methodologies or her presentation style to bend to this criticism; she clearly learned from useful feedback, but she wasn’t about to reshape her practice, to be less a designer and more a cook, to suit the program or the judging team. In the end, I read in this quiet reticence a concomitant refusal to admit the implied, gendered critique that “style” might be all a girl can muster, or that girls who take style seriously can’t be serious cooks (perhaps what Raymond Blanc meant when he decided, with both arrogance and rather poor judgement, to weigh in on the show on Twitter). Finally, Quinn revealed her “style” to be “art”, and her art to be substantial indeed. Kimberley Wilson, one of the favourites going into the final (and my personal favourite, as a viewer), took a very different but equally compelling approach to the work of the competition. A psychologist, Wilson brought a scientist’s rigour to her baking: she demonstrated a clear understanding of the chemistry behind the cooking, had obviously studied some of the most technical aspects of the craft in detail, and was often the only contestant to know the intricacies of what was expected from the blind, “technical” bake challenges (she had clearly done a lot of studying). Further, she exuded the confidence of a woman who works hard and knows she can succeed, yet brought with that confidence a charm and sense of humour that made her a pleasure to watch (and to watch succeed). Alarmingly, as Tandoh notes in her column, plenty of tweeters and social media users found this (to me heartening) mix of charm, confidence and skill “arrogant” or “smug”; such ham-fisted, retrograde assessments of a generous, talented, and plainly fiercely intelligent woman only goes to show, once more, how much of a feminist concern the work of the Bake Off need be. Finally, Tandoh, the odds-on favourite to win going into the final, created the greatest social media stir simply by appearing on-screen as most university-aged women often do in real life: self-deprecating and sadly lacking in confidence. As a viewer, I found this behaviour (like many on Twitter et al) hard to watch and frustrating at times, but as a teacher of young women I am profoundly sympathetic to it. I’ve seen this kind of routine, almost knee-jerk self-deprecation a thousand times before, especially in the smartest women; when my female students get up to speak in front of the class, or even when they take a risk and try to voice a contrary opinion, they often (at least initially) struggle to do so. And why should they not struggle? After all, they are navigating a paradox: trying to find a strong and assertive voice that will somehow not compromise the meek-sided, gendered self-image they cultivate outside the classroom (and have been encouraged, consciously or not, to cultivate for many years, by parents, other teachers, friends, and the media). Tandoh reminded me each week of the advice I’ve given before, and will give again, to these young women: do not be afraid to take up space. And work harder at it. You’ve earned every right to do so. Quinn, Wilson, and Tandoh bake very differently, but they all clearly have incredible chops. They are also similar in another, crucial respect: they are intelligent, creative, hard-working women who love to bake, do it to a professional standard, yet take pleasure from both cooking AND eating. I consider this combination of professional attributes and a love of food – both making it and consuming it – to be in itself an activist, feminist gesture: it counters the perception that serious people don’t make cake; that serious women don’t make cake; and that women shouldn’t eat too much cake, full stop. In other words, this year’s Bake Off finalists together reveal rather neatly some key patriarchal fault lines: that smart women can’t cook; that women who cook and bake can’t love to eat; that the stuff of domestic drudgery can’t be pleasure and artistry and foster women’s public success; that smart women who are ace bakers can’t be doctors, artists, philosophers, food bloggers, and pleasure seekers all at the same time. I know the Bake-Off is, of course, a flawed endeavour, not least politically; in another version of this post, I might have dwelled at length on the way it functions as another of those irritating bread-and-circus shows that helps to deflect attention from the social and fiscal crisis in which the UK remains mired. A significant part of me is indeed upset that so many of us have taken such pleasure in the program while record numbers of Brits are struggling to feed their families, as the Cameron government’s misguided, often blatantly classist austerity measures drop large portions of the lower middle class into food poverty (in 2013!). Even as I remember that context and stand firm in my political concerns, however, I see no reason not to celebrate the positive, productive social models the show offers, especially for the young men and women watching. And for me, those models are the finalists: strong, impressive women who deserve our thoughtful appreciation, not our scorn. 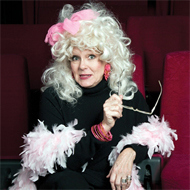 My friend and colleague Lois Weaver, aka Tammy Whynot, also of Split Britches fame, came to hang out with my students in Theatre and Performance in North America this morning. As Lois the artist, she’ll be visiting us in two weeks’ time via Skype (she lives in New York at this time of year) and the students will be responsible for interviewing her and Peggy Shaw, her longtime collaborator. Today, though, she came in person to class as Lois the scholar and teacher, to talk with us about the kinds of questions that make for a good, productive interview with a working artist. Theatre and Performance in North America is shaped around a series of interviews with working artists: we read their stuff, research their practice and politics, then host them on Skype. The goal is to help the students on the course to understand contemporary performance practice in Canada, the U.S., and Mexico as no less alive, vibrant, and immediate than the amazing work they see around them in London; the value-added bit is to help them develop some preliminary arts journalism skills (as well as better skills for doing unconventional/non-library-based research). It sounds amazing, but it’s a huge challenge for me as instructor, because most students aren’t that good at asking questions, or at least at asking actually useful questions. Even though the contemporary Anglo-American academy places a huge emphasis on asking questions and thinking critically in the classroom, it’s rare that we take the time to parse the difference with our students between a weak question and a strong one, or to explore the similarities and differences between a good research question for your essay, and a useful question for starting a research-driven conversation with another human being. I understand these nuances for myself now, thanks to years of on-the-ground practice (and plenty of research question epic fails), but I still find it mighty hard to convey them meaningfully to students. Enter Lois, to the rescue! In addition to some excellent, generous, utterly practical critiques of students’ practice questions, she also gave them today five “top tips” as they prepare to host their first Skype interview. As I reflected on these after class, I realised that Lois’s advice was speaking to me as a teacher in a much broader way than the scope of her lesson originally intended: in fact, I’ll go so far as to say her tips describe, for me, best practice for teaching preparation and classroom organisation, and I intend to hang onto them. See what you think; I think I might give them to my students, along with the syllabus, at the start of next semester’s courses, in the hope that as we get to know one another we can work on building better strategies for talking to and with one another in the classroom. Do your research. You can’t have a proper conversation with someone, about a shared topic, if you haven’t done your homework. Simple as that. This applies equally well, I think, to interviewers, students, and teachers! Bring your research with you, but leave your assumptions at home. If you’ve studied your subject closely in advance of a gig, you might have formed a variety of opinions and expectations about who that person is and what he/she will want to talk about. Check those now! Chances are you’ve created a fantasy image of your subject; that fantasy risks getting in the way of you truly meeting your subject when you do talk to him/her. Again, this is so true in the classroom: as a teacher I’m always making the (unconscious) mistake of imagining that my students will have read, understood, and gotten from the week’s reading exactly what I’ve taken away. That is almost NEVER the case. And, the more I’ve prepped for the fantasy version of the class in my head, the harder it is to adapt to the reality when it hits me in the face. Talk to the person you’re interviewing. This is my favourite tip. When we’ve prepped to do a job like host an interview or teach a lesson, it’s easy to get caught up in the list of questions or tasks we’ve brought with us. But that list is just the starting point; it’s not supposed to be the point. The point – of both a good interview and a good lesson – is to start a conversation and see where it leads us. There’s no real value in ticking the boxes/ticking off the questions; better to ask just one good, perhaps very simple question, use that question as a prompt to start a conversation, and give in to the pleasures of uncertainty (at least, for a bit). Listen. Really listen. Especially for key words, phrases, ideas that emerge as important while the interview subject is speaking. Then, don’t be afraid to pull on those threads, even to leave your prepared questions behind for a while – or perhaps for good. Leaving the prep behind is terrifying, no doubt, but sometimes it’s the risk that opens the portal to the conversation/the interview/the lesson you really need to have. (Seasoned interviewers do this extremely well, and offer excellent object lessons for teachers; for a virtuoso example, check out Jian Ghomeshi’s recent interview with Janeane Garofalo on CBC’s Q.) I’ve only abandoned my prep a handful of times in my teaching career, but each time it’s been absolutely worth it. On the flip side, those days when I stick too closely to the prep, not really hearing the covert rumblings that suggest something else is needed, usually turn out poorly, with the room’s energy quickly fizzling away. I’ve discovered over time that I don’t prep primarily in order to deliver that prepared material; I prep as a way to build my confidence in the material, and thus to encourage myself to be able to step away if and when necessary. As class was ending, I mentioned that Lois’s advice seems to boil down to two parallel (and slightly paradoxical) suggestions: do your damned homework, but don’t be afraid to walk away from your script. In this sense, she asks that those of us who interview artists, and those of us who teach the next generation of artists (and scholars, and journalists, and…), be willing to do the kind of work, and to take the leaps of faith, that artists do every day. Sage advice from a lady who knows a thing or two, believe me. How’s that for a fine contradiction! Like many teachers, I complain about students not caring enough, not understanding the value of basic things like preparing for class, not necessarily even understanding the importance of showing up for class. So why would I want to lower the stakes, make stuff seem less important? Precisely because high stakes are stressful, and lots of stress isn’t conducive to great teaching and learning. The best teachers focus on challenging students in a supportive environment where failure is tolerated. The combination is essential; just having high standards is not enough to help students learn. Bain discovers repeatedly that the best teachers expect more of their students yet treat them with genuine caring and give them a sense of control. Students learn best when they believe that the professor wants them to succeed. There’s more than one key detail here. First, Bowen argues that failure needs to be made part of a classroom’s set of expectations: when we fail we learn (as I’ve argued, anecdotally, before on this blog), but most students (me included!) reach high school or university age conditioned to fear failure rather than to recognize it as an essential component of their learning practice. So working with failure is one key tactic for raising the bar by lowering the stakes. Second, Bowen argues, via Bain, for demanding, challenging classrooms (“high standards”), in which teachers expect a lot from their students – including that trying to meet challenges means inevitable (and essential) failure somewhere along the way. Bowen then makes a bit of a cognitive leap, seemingly equating student failure with teacherly support to produce his last claim, that “students learn best when they believe that the professor wants them to succeed”. I think what he’s actually trying to do here is communicate an equation for the ideal high-bar, low-stakes classroom: challenging students + expecting and supporting students through failure = a better rate of student success, both in real-time learning and in learning how to learn for all time. I really like Bowen’s argument (and it’s much more extensive than the part I’ve just summarized; check it out in full here). In theory it makes perfect sense: demand a lot, encourage experimentation and risk-taking, and remind students that risk will be rewarded, as long as it is genuinely interrogatory, curiosity- and research-driven, regardless of outcome. This means changing what students understand “success” and “failure” to mean – effectively, shaking these terms loose from their binary relationship. But how to do this in real life? Bowen argues that “Practically, our ability to lower the risk of failure while maintaining high standards means we have to rethink what and how we assess”: that might mean creating more assessments worth fewer marks each, creating do-over opportunities, or building a learning-from-failure component into the marking of an experiment, an essay, or a group performance. I have favoured the do-over option in the past; for a while now, I’ve been working on different kinds of do-over essay assignments, and my current favourite goes like this: students are given the option of handing work in on a preliminary due date, receiving feedback and a grade from me, and then getting the chance to improve their work and hand in again on another, final deadline. Sometimes peer feedback is built into this loop, but I’m still working on best practices for peer feedback. (I’d love to hear how others work with peer-to-peer support on writing assignments – I find it genuinely tricky because so few students understand, even with some practice, what makes writing good, bad, or great). The key to my do-over assignment is two-fold: first, students get concrete suggestions from me on how to improve their papers, and if they do those things and hand in again their marks will go up. (If they do what I suggest but the results aren’t that much better, the mark doesn’t rise that much, but it still rises. How to deal better with this relatively common scenario is something else on which I’m still working.) Second, students are guaranteed that if they hand in again their marks won’t go down. Thus, if they take the second chance, the stakes are pretty low, but the potential for success, defined as a good mark, is quite high. Last semester I used the above do-over on my students in my Naturalism seminar, and the outcomes were overall very good – as was student feedback on the assignment. Bowen confirms my hunch as to why: “Assessments that promote learning combine low-stakes and high-quality feedback. Both foster change and are highly motivating; it is easier to try something new if the stakes are low and easier to change when you are being encouraged and when you know exactly what change is needed.” I’ve hit an ethical snag, though – one I hadn’t even considered until it was pointed out to me by a colleague whose teaching I greatly respect. This method of assessment may work well for me and my classroom, but it can also create a perception of unfairness when my students are part of a tightly-knit cohort working in a small, close department. Queen Mary Drama has a rule in place (principally to promote fair, equitable practice across the board, while also protecting instructors’ time) that prevents us from reading and commenting on students’ work in advance beyond a very small proportion (about 10% of a paper); this gives us a very clear line to offer students who try to impinge on our time by getting us to, essentially, do their editing and leg-work for them in office hours. Thus, even though my do-over assignment has a basis in sound pedagogical practice, and even though it was built clearly (and equitably, for all students in the class) into my Naturalism syllabus from day one, it skirted a bit close to our departmental red line, as it risked placing unwarranted and unfair expectations on my colleagues. I understand the issues at stake here, but I remain on the fence about their consequences. Naturally I want to be as fair as possible to my colleagues, but my first responsibility, as a teacher, is always to my students. Every year I see more and more students struggle to write well, and I know that, even though I’m trained to teach theatre, not writing skills, it’s my job to educate the whole student, which includes the student writer – and the student writer needs more help than the vast majority of Arts and Humanities programs currently offer. How to solve this catch-22? I suspect one answer is a curriculum review (luckily, I think Queen Mary has one on the horizon, and next week is our first Teaching and Student Support Committee meeting of the year…). That just might make (sanctioned) space for a few do-overs.